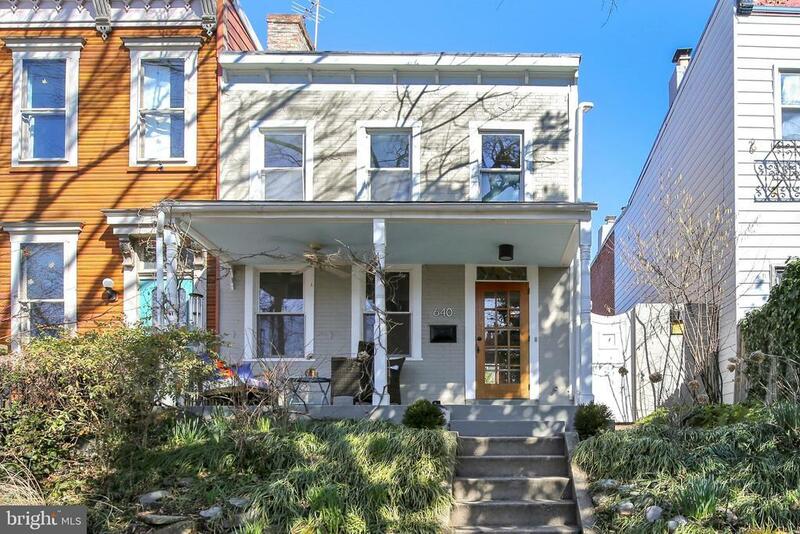 Beloved 1846 Capitol Hill Farmhouse Retreat situated moments from Eastern Market and Barracks (Restaurant) Row, easy walk to the new Whole Foods, Trader Joes and Nats Stadium. This urban oasis is your chance to own a truly RARE find on the Hill. Exposed original pre-Civil War hand hewn beams brighten throughout. Open living room/dining room with cozy wood burning stove warmly welcomes you into this stylish home. Foodies Haven, NEW Gourmet Kitchen with quartz counter tops, custom new large skylight, Blue Star Custom Professional Gas Range calls out for a Starred Chef to whip up delicacies to be shared in the private courtyard overlooking the deep Zen garden. BONUS detached Studio/Office/Indoor dining space full of light perfect for so many uses, accessible without going through the house. Speak easy garden gates make it possible to screen who comes into your soiree. Upstairs boasts a NEWLY renovated bathroom/wet room with a divinely deep tub heated with its own water tank so you can soak for hours and never run out of hot water. Pocket doors and bright light make upstairs feel like a B&B getaway, far from the hustle and bustle. The south facing front porch is a perfect perch for an evening cocktail overlooking the lovely landscaped front garden. The rear patio/garden is completely private, while well connected to the houses interior through multiple full glass doors, for indoor/outdoor living perfect for entertaining. There is even an outside shower and separate access to the lower level loo. This gem has a long history which has been researched by the historical society that we cant wait to share with you! Exclusions: Round Glass mirror in the upstairs bathroom above the sink.